Lycorine (Fig.1) is a type of isoquinoline alkaloid extracted from plant medicine Lycoris radiata which has long been used as a traditional Chinese medicine. Recent studies showed that lycorine exhibits antiviral[2, 3], anti-inflammatory, antimalarial and antitumor effects. More importantly, it has been reported that lycorine displayed significantly higher antiproliferative activity in cancer cells than in normal cells, thus it could be a promising anticancer drug in the future. However, lycorine's poor solubility both in oil and water would restrict its clinical use. Therefore, a suitable formulation of lycorine which can improve its solubility and be applied in the future clinical treatment is highly desirable. Recently, the study of lipid nano-emulsions (LNEs) has increasingly attracted attention. LNEs are nano-scale oil in water emulsions, which has a central oil core and could be stably dispersed in water. LNEs droplet sizes are in the range of 20-200 nm and show narrow size distribution. Due to the small droplet size, this formulation can be stable for a long time against sedimentation and creaming, hence offering increased stability. Such long-term stability makes it suitable for commercial use, especially for drug delivery[11, 12]. However, non-targeted LNEs loaded with lycorine which can be taken up by normal cells could still cause undesired side effects. A targeted LNEs delivery system with specificity would minimize side effects to normal cells. The surface sugar modified LNEs can be used for tumor cell targeting [13, 14]. This is due to the fact that rapid proliferation of tumor cells increased their need for nutrients compared with normal cells, which resulted in the over-expression of lectin-like receptors that encompass high affinity for polysaccharide moieties including mannose, galactose and lactose. Therefore, mannosylated nanoparticles can target to tumor cells due to the preferential uptake by receptor-mediated internalization via lectin receptors on the surface of tumor cells. As a result, using mannosylated LNEs as carriers for the anticancer drug lycorine may probably increase its tumor cellular uptake. In this study, lycorine loaded mannosylated LNEs were prepared for selective drug delivery to A549 lung epithelial cancer cell line. Oleic acid (OA) was employed as the lipophilic complexing agent to form lycorine-oleic acid ionic complex (LYC-OA) in order to enhance the lipophilicity of lycorine. Then lycorine-oleic acid ionic complex (LYC-OA) loaded lipid nano-emulsions (LYC-OA-LNEs) as well as mannosylated lycorine-oleic acid ionic complex loaded lipid nano-emulsions (M-LYC-OA-LNEs) were prepared by solvent injection method. 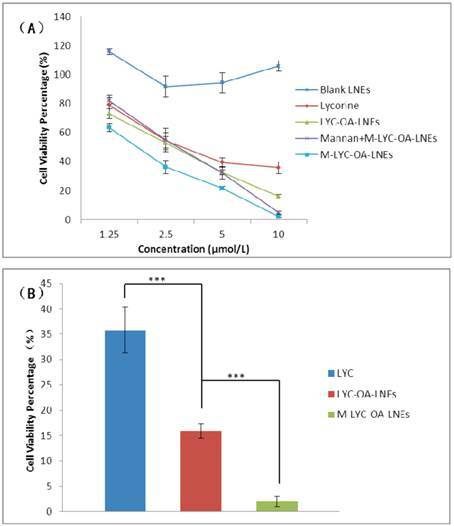 The in vitro growth inhibition activity and cellular uptake of both LYC-OA-LNEs and M-LYC-OA-LNEs were investigated using A549 lung epithelial cancer cell line. Lycorine (Purity: 99.84%, HPLC) was purchased from Hongsheng Plant Materials CO., Ltd (Sifang, China). Oleic acid was kindly gifted by Lipoid CO., Ltd (Germany). Soybean phospholipid was purchased from Taiwei Medical CO., Ltd (Shanghai, China). Soybean oil was provided by Beiya Medical oil CO., Ltd (Tieling, China). The reagents of Trypsin, 3-(4,5-Dimethylthiazol-2-yl)-2,5-diphenyltetrazolium bromide (MTT), DAPI were acquired from Sigma (USA). All other chemicals were of analytical grade or better. A549 and CHO cell line was obtained from Shanghai Institutes for Biological Sciences (SIBS; Shanghai, China). A549 cells were cultured in RPMI 1640 medium (Hyclone, USA) supplemented with penicillin, streptomycin and 10 % calf serum (Minhai, Gansu, China). CHO cells were cultured in DMEM medium (Hyclone, USA) supplemented with penicillin, streptomycin and 10 % calf serum (Hyclone, USA). Cells were maintained in a 37 degree, 5 % CO2, fully humidified incubator. Lycorine and OA (molar ratio: 1/10.2) were dissolved in dry tetrahydrofuran (5 mg/ml) and the solution was maintained at 50 ± 1 degree in oil bath for 2 hours while stirring. Then the solvent was removed under reduced pressure and the lycorine-oleic acid ionic complex (LYC-OA) was formed. In order to compare the lipopilicity of LYC and LYC-OA, their saturated solubility in n-octanol and soybean oil were determined. Briefly, LYC was dissolved in n-octanol and soybean oil respectively and LYC-OA was also dissolved in n-octanol and soybean oil respectively. Then they were agitated for 48 hours in a thermostatted shaker bath at 25 ± 1 degree. After equilibration, the samples were centrifuged at 10000 rpm at 25 degree for 15 minutes. The supernatants were diluted in isopropanol and subsequently quantified (excitation/emission: 280/327 nm) by fluorescence spectrophotometer (RF-5301 PC, Shimadzu, Kyoto, Japan). LYC-OA-LNEs were prepared by solvent injection method with slight modification. Briefly, LYC-OA, soybean phospholipid and soybean oil were dissolved in isopropanol (23 mg/ml) at 70 degree. These components' molar ratio is shown in Table 1. This blended solution was rapidly injected through a syringe into a stirred aqueous phase at room temperature. The volume of this suspension was reduced to its 1/10 by a rotary evaporator (Buchi, Swizerland) under reduced pressure at 50 degree to remove the organic phase. 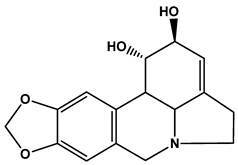 N-Octadecyl-D-mannosylamine was synthetized and purified according to the reported method with slight modification. Octadecylamine (200 mg, 0.74 mmol) and mannose (90 mg, 0.50 mmol) were dissolved in 0.5 ml of menthol at 70 degree and stirred for 15 minutes. The solid was collected and recrystallized from 3 ml of ethanol. The reaction scheme is shown in Figure A/Scheme 1. Characterization and spectral data of N-Octadecyl-D-mannosylamine: 1H NMR (400 MHz, DMSO): 0.83~0.87 (3H, t, J=6.4 Hz); 1.23~1.37 (34H, m); 2.82~3.67 (6H, m); 3.88~3.91 (1H, d, J=11.2 Hz); 4.26~4.30 (1H, t, J=5.6 Hz); 4.54~4.64 (3H, m). Ms m/z: 432.4 (M+H)+; Ms m/z: 454.4 (M+Na)+. In this study, M-LYC-OA-LNEs were also prepared by solvent injection method as described in the section of “preparation of LYC-OA-LNEs”, and the mannose coating was carried out by adding N-Octadecyl-D-mannosylamine into the lipid matrix. Firstly, N-Octadecyl-D-mannosylamine, LYC-OA, soybean phospholipid and soybean oil were dissolved in isopropanol (23 mg/ml) at 70 degree. These components' molar ratio is shown in Table 1. This blended solution was rapidly injected through a syringe into a stirred aqueous phase at room temperature. The volume of this suspension was reduced to its 1/10 by a rotary evaporator (Buchi, Swizerland) under reduced pressure at 50 degree to remove the organic phase. Fluorescein labeled lycorine-oleic acid ionic complex lipid nano-emulsions (F-LNEs) and Fluorescein labeled mannosylated lycorine-oleic acid ionic complex lipid nano-emulsions (F-M-LNEs) were separately prepared by solvent injection method as described in the sections of “preparation of LYC-OA-LNEs” and “preparation of M-LYC-OA-LNEs”. The fluorescent marker was carried out by adding 2.4 % (w/w) fluorescein-labeled PE derivative (1,2-dioleoyl-sn-glycero-3-phosphoethanolamine-N-[carboxyfluorescein], N-F-PE) of soybean phospholipid into the lipid matrix (excitation/emission: 488/530) nm). The morphology of both coated and uncoated LNEs were examined by transmission electron microscopy (Tecnai G2F20 FEI, Holland). The samples were stained with 2 % (w/v) phosphotungstic acid for 2 minutes and placed on copper grids with films for viewing. Molar ratio of components in formulation of mannosylated lycorine-oleic acid loaded lipid nano-emulsions (M-LYC-OA-LNEs) and lycorine-oleic acid loaded lipid nano-emulsions (LYC-OA-LNEs). (Scheme 1) Reaction scheme of N-Octadecyl-D-mannosylamine. The mean particle size and zeta potential of both coated and uncoated LNEs were determined by photon correlation spectroscopy (Malvern Zetasizer Nano ZS90, UK) at 25 degree. A confocal fluorescence microscopy was used to observe the intracellular distribution of both coated and uncoated LNEs. A549 cells were cultured for 24 hours on 14-mm2 sterile glass coverslips which were pre-immersed in the culture medium in humidified incubator at 37 ℃ with 5 % CO2 atmosphere. 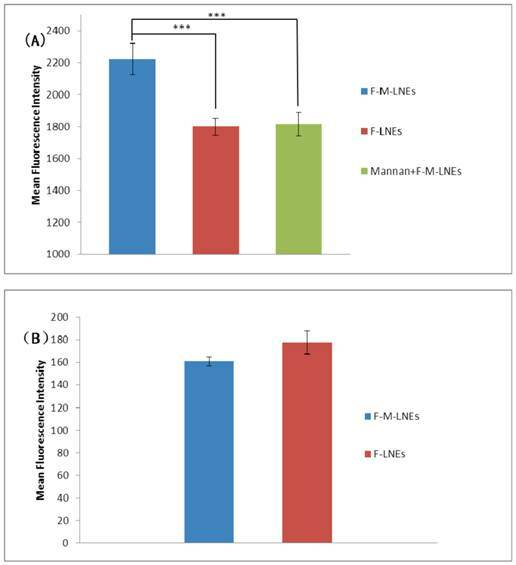 Then the cells were exposed to the same concentration (about 5.4 μg/ml) of F-LNEs, F-M-LNEs or F-M-LNEs plus 0.125 mg/ml mannan respectively. Here 0.125 mg/ml free mannan was used as the competitive inhibitor of F-M-LNEs. After 1 hour of incubation, the medium was removed and the cells were washed by PBS for 3 times followed by fixing with 4 % paraformaldehyde in PBS. After 10 minutes, the paraformaldehyde solution was removed and cells were washed by PBS for once, then 2 μg/ml DAPI in PBS was added to each well and incubated for another 10 minutes. At last the DAPI solution was removed and cells were washed by PBS for 3 times. Fluorescent images of cells were examined by confocal microscopy (Carl Zeiss LSM510, Germany). Cell uptake study was performed using flow cytometry analysis. Cells were seeded at a density of 4 × 106 cells per well in 2 ml of medium in a six-well tissue plate (Corning, NY, USA) and incubated for 24 hours in humidified incubator at 37 ℃ with 5 % CO2 atmosphere. Then F-LNEs, F-M-LNEs or 0.125 mg/ml mannan plus F-M-LNEs were added to designated wells with the same concentration (about 5.4 μg/ ml). After being incubated for 1 hour at 37 ℃, each well was washed with PBS for 3 times in order to remove any LNEs that were not taken up by cells. Then the cells were trypsinized (0.25 %, w/v) and pelleted by centrifugation (2000 rpm), washed with cold PBS to remove trypsin. Samples were examined by flow cytometry using the FACScan AriaTM (Becton Dickinson, San Jose, CA, USA). The intracellular FITC was excited with an argon laser (488 nm) and fluorescence was detected at 530 nm. Files were collected of 10000 gated events and analyzed with the FACStation software program. The growth inhibition activity of free lycorine, LYC-OA-LNEs, M-LYC-OA-LNEs and M-LYC-OA-LNEs plus 0.125 mg/ml mannan were performed by using 3-(4,5-di-methylthiazol-2yl)-2,5-diphenyl tetrazolium bromide (MTT) based colorimetric assay. Cells were plated at a density of 3000 cells per well in 200 μl medium in 96-well plates for 24 hours in a humidified incubator at 37 ℃ with 5 % CO2 atmosphere. A series of concentrations of free lycorine, LYC-OA-LNEs, M-LYC-OA-LNEs, M-LYC-OA-LNEs plus 0.125 mg/ml mannan (1.25, 2.5, 5 and 10 μmol /L, respectively) and blank LNEs were added into different wells. After 72 hours of incubating, 20 μl MTT solution (5 mg/mL in PBS, pH 7.4) was added to each well, and samples were kept in the incubator for 4 hours. The medium was then removed and the converted formazan in each well was dissolved by 150 μl of DMSO. The absorbance was measured by Varioskan Flash (Thermo Scientific, USA) at 570 nm. The cell viability (%) related to control wells with cell culture medium was calculated as the following equation: Cell viability percentage (%) = (OD of tested sample/OD of negative control) × 100 %. Where OD means optical density: the absorbance of an optical element for a given wavelength per unit distance. All the experiments were repeated at least three times. The statistical analysis of the samples was performed by using a Student's t-test with P-values < 0.05 as the minimal level of significance. Lycorine is a pyrrolo[de]phenanthridine ring-type alkaloid (Fig. 1), its poor solubility both in oil and water is an obstacle for its clinical application. This study aimed at increasing the lipophilicity of lycorine. According to the structure of lycorine, the method of ion-pair formation could be used. This method was used to modify the lipophilicity of ionizable drugs by shielding their charge with an oppositely charged ion without chemical modifications [20, 21]. Generally, the protonated nitrogen on the ring of lycorine bears positive electrostatic charge, and the carboxyl group of fatty acid provides negative charge. As a consequence, lycorine and fatty acid can form ion-pair complex and the long carbon chain brought by the fatty acid can enhance the lipophilicity of lycorine. In this study, oleic acid (OA) could be employed as the counter ion because it is a biodegradable and physiological long chain fatty acid with low toxicity. However, both the acidity of OA and the basicity of lycorine are very weak, bringing difficulty in forming ion-pair formation. Complex formation is generally driven by electrostatic attraction, hydrophobic interaction and hydrogen bonding. Electrostatic force dominates the interactions between polar molecules. Solvents with low dielectric constant are favored for ion pair formation. In this study, tetrahydrofuran (with low dielectric constant of 7.58) was chosen as the solvent not only to provide sufficient solubility for LYC, OA and their complex, but also to facilitate this ion pair formation. In addition, if a little water exists in this solvent, such ion-pair could not form. This may be due to the fact that the dieletric constant of water is as high as 78.5, which is not suitable for ion-pair forming. Moreover, the acidity of water (pKa = 7) is stronger than that of oleic acid (pKa = 9.85). Thus under the condition where water exists, the dissociation of oleic acid will be inhibited to some extent hence inhibit the ion-pair formation. On the contrary, if the solvent was dried first, such ion-pair could form. This is because tetrahydrofuran is a type of polar aprotic solvent, which facilitates the dissociation of OA hence enhanced its acidity. After the carboxylate ion of OA attacked the protonated nitrogen on lycorine, LYC-OA was formed. The postulated structure of this ion-pair complex is shown in Fig. 2. Measuring the saturated solubility in some organic solvent is a basic method for evaluating the effects of ion pair formation on lipophilicity. The saturated solubility in n-octanol and soybean oil of LYC and LYC-OA is shown in Fig.3. 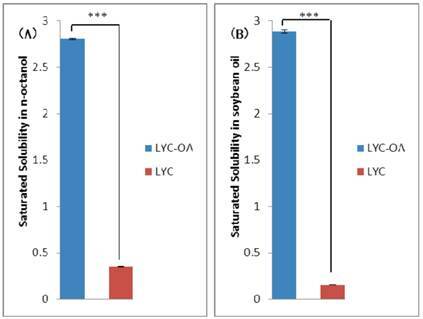 LYC-OA showed better saturated solubility than LYC (8 times in n-octanol and 18 times in soybean oil respectively), indicating its higher lipophilicity. In this study, LYC-OA-LNEs were prepared by solvent injection method, which means LNEs were prepared by rapidly injecting a solution of lipids in water-miscible solvents into water. This method offers clear advantages such as the use of pharmaceutically acceptable organic solvents, easy handling and a fast production process without technically sophisticated equipment . In our formulation of LYC-OA-LNEs, the excipients were OA, soybean oil (injectable grade) and soybean phospholipid, which are biodegradable and show low toxicity. In this study, M-LYC-OA-LNEs were also prepared by solvent injection method as described in section of “preparation of LYC-OA-LNEs” and the mannose coating was performed by adding N-Octadecyl-D-mannosylamine into isopropanol with the other lipid matrix in the first step of preparation. The structure of N-Octadecyl-D-mannosylamine suggests it may be amphiphilic because the mannose residue is hydrophilic and the long carbon chain is lipophilic. Therefore, it is supposed that during the formation process of nanoparticles, the long carbon chain would insert into the lipid particles while the mannose residue may expose to water. The postulated structure of this nanoparticle is shown in Fig.4. Postulated structure of the lycorine-oleic acid ionic complex. The saturated solubility of lycorine-oleic acid complex (LYC-OA) and lycorine (LYC) in n-octanol (A) and soybean oil (B) (n=3, ***p<0.001, Student's t-test). Results are presented as mean ± standard deviation (S.D.). Schematic representation of mannosylated lycorine-oleic acid loaded lipid nano-emulsions. The average particle size and zeta potential of M-LYC-OA-LNEs and LYC-OA-LNEs are shown in Table 2. Zeta potential is an important parameter to determine the stability of colloidal dispersion. The absolute value of zeta potential of both coated and uncoated LNEs were higher than 40mV. The electrostatic repulsion among nanoparticles can prevent the coalescence of the droplets, thus such high zeta potential indicated good stability of these LNEs. In addition, the negative charge observed is possibly due to the distribution of negatively charged carboxyl groups on the surface of the particle, which suggested that OA could also act as co-emulsifier. The result is in good agreement with previous reports[24, 25]. The TEM micrographs of both coated and uncoated LNEs are shown in Fig. 5. Mannose was observed darker than the lipid in TEM micrograph due to its higher density of electron cloud. The surface of particles in Fig. 5A was darker than that in Fig. 5B may be attributed to their mannose coating. Poor lipophilic drug can hardly achieve high entrapment efficiency in LNEs due to the solution capability of the lipid matrix. In our study, the entrapment efficiencies of both coated and uncoated LNEs based on LYC-OA were higher than 80 % (Table 2). On the contrary, if incorporating LYC in LNEs without complexation, the lycorine crystal would quickly dissolve out. Therefore, with the aid of forming LYC-OA ion-pair complex, the lipophilicity of LYC was enhanced hence the high entrapment efficiency in LNEs was achieved. The drug loading contents of both coated and uncoated LNEs are shown in Table 2. Physical property of mannosylated lycorine-oleic acid loaded lipid nano-emulsions (M-LYC-OA-LNEs) and lycorine-oleic acid loaded lipid nano-emulsions (LYC-OA-LNEs) (n=5). Results are presented as mean ± standard deviation (S.D.). The intracellular distribution of F-LNEs and F-M-LNEs was observed under confocal microscopy on A549 cell lines. Fig. 6 shows the confocal microscopy images of A549 cells after being exposed to F-M-LNEs (Fig. 6A), F-LNEs (Fig. 6B) or F-M-LNEs plus 0.125 mg/ml mannan (Fig. 6C) at 37 ℃ for 1 hour. Formulations showed green fluorescent stains; nuclei were stained with DAPI and showed blue fluorescent stains. Cells exposed to coated LNEs (Fig. 6A) depicted stronger intracellular green fluorescent intensity than that exposed to uncoated LNEs (Fig. 6B) suggesting mannose coating could cause more cellular uptake of LNEs. This may due to the fact that uncoated LNEs were taken up by A549 cells through nonspecific endocytosis, whereas the mannosylated LNEs can be taken up by receptor-mediated endocytosis. What's more, cells incubated with coated LNEs plus 0.125 mg/ml mannan (Fig. 6C) resulted in weaker intracellular fluorescent than that incubated with coated LNEs alone. This may be due to the preferential binding of mannan with mannose receptor saturating them and suppressed the entry of mannosylated LNEs via receptor-mediated endocytosis. These results suggested that the increased cellular uptake of coated LNEs was attributed to the lectin receptors-mediated endocytosis [26-28]. Transmission electron microscopy micrograph of mannosylated lycorine-oleic acid loaded lipid nano-emulsions (A) and lycorine-oleic acid loaded lipid nano-emulsions (B). Scale bar represents: 100 nm. Confocal microscopy images of A549 cells incubated with fluorescein labeled mannosylated lycorine-oleic acid ionic complex lipid nano-emulsions (F-M-LNEs) (A), fluorescein labeled lycorine-oleic acid ionic complex lipid nano-emulsions (F-LNEs) (B) or F-M-LNEs plus 0.125 mg/ml mannan (C), at 37 °C for 1 hour (Magnification 63×). Fluorescein-labeled LNEs showed green fluorescent stains; nuclei were stained with DAPI showing blue fluorescent stains. In order to quantitatively compare the cellular uptake of F-M-LNEs, F-LNEs and F-M-LNEs plus 0.125 mg/ml mannan on A549 cells, cell uptake study was carry out by the flow cytometry method. 2.4 % (w/w) N-F-PE of total lipid matrix was used as fluorescent maker, and the intracellular fluorescence intensity was directly proportional to the amount of N-F-PE internalized. The intracellular fluorescent intensity in A549 cells which were exposed to F-M-LNEs, F-LNEs or F-M-LNEs plus 0.125 mg/ml mannan for 1 hour at 37 °C is shown in Fig. 7A. The cells incubated with mannosylated LNEs showed higher fluorescent intensity than those incubated with uncoated LNEs as well as the coated LNEs plus 0.125 mg/ml manna. The mean fluorescent intensity of cells after above treatments were 2222.2 ± 99.1, 1799.6 ± 52.3, 1816.8 ± 72.7 respectively. This may be attributed to the receptor-mediated endocytosis followed by internalization of the nanoparticles. Such result agreed with the study of intracellular distribution of formulations by confocal microscopy. Fig. 7B shows intracellular fluorescent intensity in CHO cells which were exposed to F-M-LNEs or F-LNEs for 1 hour at 37 °C. Mannosylated LNEs could not be taken up by CHO cells via receptor-mediated endocytosis because mannose receptors are not expressed on their membrane . The intracellular fluorescent intensity in CHO cells exposed to F-M-LNEs or F-LNEs showed no significant difference, which further indicated the preferential uptake of F-M-LNEs on A549 cells may be attributed to the receptor-mediated endocytosis . Intracellular fluorescent intensity in A549 cells (A) or CHO cells (B). A549 cells were incubated with fluorescein labeled mannosylated lycorine-oleic acid ionic complex lipid nano-emulsions (F-M-LNEs), fluorescein labeled lycorine-oleic acid ionic complex lipid nano-emulsions (F-LNEs) or F-M-LNEs plus 0.125 mg/ml mannan for 1 hour at 37 °C (n=5, ***p<0.001, Student's t-test). CHO cells were incubated with F-M-LNEs or F-LNEs for 1 hour at 37 °C (n=5, p>0.05, Student's t-test). The concentration of fluorescent marker incorporated in F-M-LNEs and F-LNEs was about 130 ng/ml. Results are presented as mean ± standard deviation (S.D.). MTT assay was performed to test the growth inhibition activity of free lycorine, LYC-OA-LNEs, M-LYC-OA-LNEs and M-LYC-OA-LNEs plus 0.125 mg/ml mannan on A549 cell lines. MTT will produce a dark blue formazan product when incubated with living cells. DMSO will dissolve such product then shows blue color. The number of living cells after 72 hours of incubation is directly proportional to the intensity of such blue color, which can be measured quantitatively by spectrophotometry. The survival curves of A549 cells showed that at the concentration range of 1.25-10 μmol/L, the inhibition percentage increased when the concentration of LYC either in free form or incorporated in LNEs was increased (Fig.8A). What's more, such inhibition percentage showed the trend as: M-LYC-OA-LNEs> LYC-OA-LNEs>free LYC at the concentration of 10 μmol/L (Fig.8B). LYC showed the worse activity may be due to its poor lipophilicity that limited its cellular uptake; whereas by making LYC-OA ion-pair, the lipophilicity of LYC was enhanced and after incorporating them into lipid nano-emulsions, the inhibition activity of LYC-OA-LNEs was accordingly better than that of LYC. M-LYC-OA-LNEs showed best activity may be due to the mannose on the nanoparticles promoted better internalization with the lectin receptors on A549 cells hence enhanced its cellular uptake. Such result consisted with the study of intracellular distribution of formulations by confocal microscopy as well as the cell uptake study by flow cytometry. In addition, blank LNEs exhibited even nontoxicity under various concentrations, suggesting the lipid matrix of LNEs used in this study was well tolerated under formulation concentrations. Moreover, at the concentration range of 1.25~5 μmol/L, the inhibition rate of M-LYC-OA-LNEs plus 0.125 mg/ml mannan was close to that of LYC-OA-LNEs, indicating the receptor-mediated endocytosis of M-LYC-OA-LNEs was suppressed by the competitive inhibition effect of 0.125 mg/ml mannan. At the high drug concentration of 10 μmol/L, the inhibition activation of M-LYC-OA-LNEs plus 0.125 mg/ml mannan was close to that of M-LYC-OA-LNEs. The most probable interpretation is that the existing of high concentration of coated LNEs compromised the competitive inhibition effect of 0.125 mg/ml mannan, thus the receptor-mediated endocytosis of M-LYC-OA-LNEs was not suppressed. Growth inhibition activity study of LNEs on A549 cell lines. The A549 cells were treated with lycorine (LYC), lycorine-oleic acid loaded lipid nano-emulsions (LYC-OA-LNEs), mannosylated lycorine-oleic acid loaded lipid nano-emulsions (M-LYC-OA-LNEs) or M-LYC-OA-LNEs plus 0.125 mg/ml mannan at different lycorine concentration for 72 hours (A) (n=5). Growth inhibition activity of LNEs towards A549 cells at lycorine concentration of 10 μmol/L for 72 hours (B) (n=5, ***p<0.001, Student's t-test). Results are presented as mean ± standard deviation (S.D.). The 50% inhibition concentration (IC50) of LYC, LYC-OA-LNEs and M-LYC-OA-LNEs are shown in Table 3. M-LYC-OA-LNEs showed significant higher IC50 than LYC-OA-LNEs (p<0.001), also LYC-OA-LNEs showed significant higher IC50 than LYC (p<0.001). IC50 values of mannosylated lycorine-oleic acid loaded lipid nano-emulsions (M-LYC-OA-LNEs), and lycorine-oleic acid loaded lipid nano-emulsions (LYC-OA-LNEs) and lycorine (LYC) on A549 cell lines (72 hours). Results are presented as mean ± standard deviation (S.D.). ***p<0.001, n=5, Student's t-test. Significant difference between LYC-OA-LNEs and LYC; significant difference between M-LYC-OA-LNEs and LYC-OA-LNEs. M-LYC-OA-LNEs could be a promising formulation for tumor targeting delivery of LYC by parenteral administration. First of all, the excipients such as OA, soybean oil are of low toxicity and clinically available for parenteral usage. Secondly, LNEs have already been used as drug delivery systems for administration through intravenous injection for the purposes of nutrition (e.g. administration of fats), delivery of vaccines, gene carriers, controlled drug release and targeting of drugs to specific sites either the hepatic system or a tumorized organ in the body. Nano-emulsions are advantageous for intravenous administration, because of the strict requirements of this route of administration, especially the necessity for a formulation droplet size lower than 1 μm. Although lectin receptors are also expressed on other cells rather than tumor cells (e.g. dendritic cells), sugar modified LNEs could still targeting to tumor site. This is because such nano-formulations can be passively accumulated in tumor tissue though EPR effect, followed by lectin receptor mediated tumor cell uptake. Govind P.Agrawal's group demonstrated that using N-Octadecyl-D-mannosylamine as the mannose coating for nanoparticle drug delivery systems facilitated the delivery of anti-cancer drug to tumor site with reduced access to normal tissue. In addition, the in vitro experiments in current study proved increased tumor cell uptake and tumor cell growth inhibition activity of this coated formation compared with LYC and uncoated ones, suggesting these particles can ferry LYC selectively to tumor tissue and reduce its side effect when used in future clinic. In this study, a mannosylated lipid nano-emulsion formulation loaded with lycorine-oleic acid complex was prepared. Lycorine-oleic acid ionic complex was made and the lipophilicity of LYC was greatly improved, which facilitates the high entrapment efficiency of this formulation. Mannosylation augments the cellular uptake and growth inhibition activity of lycorine lipid nano-emulsion on A549 cell lines, indicating targeted delivery of lycorine to tumor tissue may be achieved. 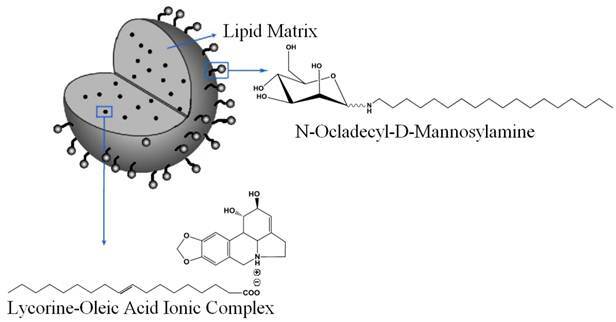 The developed mannosylated lipid nano-emulsion may be used as a delivery carrier of drug or imaging probe with the potential of being applied in the diagnosis and treatment of cancer. LYC: lycorine; OA: oleic acid; LNEs: nano-emulsions; LYC-OA: lycorine-oleic acid ionic complex; LYC-OA-LNEs: lycorine-oleic acid loaded lipid nano-emulsions; M-LYC-OA-LNEs: mannosylated lycorine-oleic acid loaded lipid nano-emulsions; F-LNEs: fluorescein labeled lycorine-oleic acid ionic complex lipid nano-emulsions; F-M-LNEs: fluorescein labeled mannosylated lycorine-oleic acid ionic complex lipid nano-emulsions; FITC: fluorescein isothiocyanate; MTT: 3-(4,5-Dimethylthiazol-2-yl)-2,5-diphenyltetrazolium bromide; N-F-PE:1,2-dioleoyl-sn-glycero-3-phosphoethanolamine-N-[carboxyfluorescein]; DAPI: 4',6-diamidino-2-phenylindole; DMSO: dimethyl sulfoxide; TEM: transmission electron microscopy; EPR effect: enhanced permeability and retention effect. The work was funded by the National Basic Research Programs of China (973 program, No: 2009CB930300 and 2012CB724002) and supported by the State Key Program of National Natural Science of China (No: 81130060). Corresponding author: Tao Gong, Zhirong Zhang, Key Laboratory of Drug Targeting and Drug Delivery System, Ministry of Education, Sichuan University, No. 17. Section 3. Southern Renmin Road, Chengdu 610041, People's Republic of China. Tel + 86 028 8550 1615; Email gongtaoycom (T. Gong); zrzzlsina.com (Z.R. Zhang).